I’m a bit ashamed to admit that the first time I ever tried gelato was only last year, and in Macau of all places. I had heard about this famous Italian-style ice cream many times over the years, but nothing prepared me for my first taste: creamy, smooth and totally refreshing; thoroughly unlike any ice cream I’d ever tried. I’m still looking forward to trying the real stuff in Italy someday, but thanks to Ittiake Kittiungool, an enterprising 33-year-old Thai, tasting authentic Italian-style gelato now requires only a trip to Siam Paragon. Kittiungool, who first discovered quality ice cream while a university student in San Francisco, took his newfound interest to lengths not many would be willing to follow. After returning home to Thailand, he arranged to take courses in ice cream making at the Frozen Dessert University in Bologna, Italy. At this institution, the only of its kind in the world, Kittiungool studied under Luciano Ferrari, a well-respected figure in the world of Italian-style ice creams. Upon returning to Thailand, he opened up Gelate, a shop selling gelato, milk-based ice creams, and sorbetto, fruit-based sorbets, at Central World Plaza. 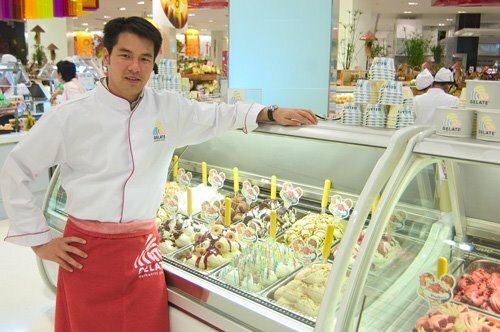 Gelate owner Ittiake Kittiungool studied at Italy's Frozen Dessert University, where he learned the art of creating flavorful gelate and sorbettos. As we are talking two girls walk by and I overhear them remarking how delicious Gelate’s ice cream looks. 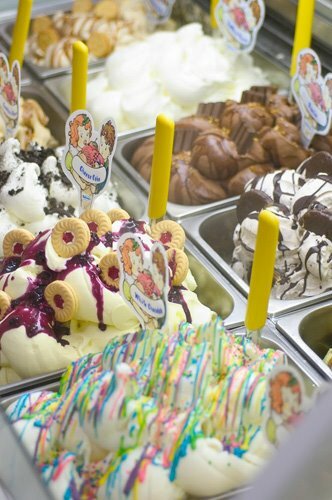 This prompts Kittiungool to mention what is perhaps the single most recognizable aspect of gelato: its appearance. “How it looks is the most important thing,” he explains. “That’s what catches people’s attention.” At Gelate this involves whipping the ice cream into tall peaks, and decorating these with generous chunks of the various ingredients. Kittiungool even goes as far as to serve the gelato with the traditional flat metal spatulas rather than the ubiquitous ice cream scoop. This emphasis on authenticity has led to Kittiungool importing ingredients, machinery, and even display cases directly from Italy. “Our concept is to make everything as real as possible,” he explains. A few of the gelate available at Gelato, a recently opened ice cream shop at Siam Paragon. I ask Kittiungool if he has made any allowances for Thai tastes, and he explains that Thais aren’t as fond of sweet tastes as the Italians are, so his gelato is significantly less sugary. So far people in Bangkok seem to favour his milk-based gelate, and hazlenut and cheesecake are currently the shop’s best sellers. He offers me a bowl of three gelate: pistachio, double chocolate and bacio (Italian for “kiss”), a mixture of chocolate and hazelnut. Both of the nut-flavored gelate resonate with the flavour of real nuts, as opposed to powders or syrups, and the texture is smooth and almost fluffy. The pistachio gelato in particular is deliciously fruity and savory, with its green color an indicator of the generous amount of pistachios it includes. Gelate’s sorbettos consist of just fruit and syrup, and are thus fat-free, and the most popular flavour is fruitti di bosco, mixed fruit. Right now Gelate can only be found at Siam Paragon, but Kittiungool plans to open outlets in Central World Plaza and The Mall Ngam Wong Wan in the coming months. “I’d love to have an shop with fresh ice cream made on-site, and a Lambretta hanging from the ceiling!” the young entrepreneur tells me while I try finish every last drop of my ice cream. Gauging by the product he’s created, it seems like it’s only a matter of time. Gelate is located inside Gourmet Market, basement floor, Siam Paragon.